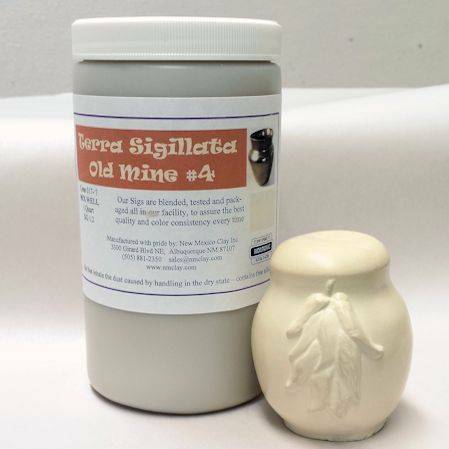 Ball Clay Om4 Terra Sigillata is a very refined clay slip, it is usually polished to a high sheen and low-fired. Apply 3-8 flowing coats to leather hard or dry, smooth, clay. Allow to dry and polish with a soft cloth or chamois. Fire to any temperature you like but the shine is best around Cone 017 (1450F) to Cone 06 (1820f). May Be used on any clay at any temp, BUT you must test it to see if it will do what you want. Terra sigillata is ~ a contemporary studio pottery technique supposedly inspired by ancient pottery. Usually roughly translated as 'sealed earth', the meaning of 'terra sigillata' is 'clay bearing little images' (Latin sigilla), not 'clay with a sealed (impervious) surface'. The archaeological term is applied, however, to plain-surfaced pots as well as those decorated with figures in relief. In contemporary ceramic art, 'terra sigillata' describes a watery refined slip used to facilitate the burnishing of raw clay surfaces and used to promote carbon smoke effects, in both primitive low temperature firing techniques and unglazed alternative western-style Raku firing techniques. Terra sigillata is also used as a brushable decorative colourant medium in higher temperature glazed ceramic techniques.